✓Heavy-Duty Construction. Coolers are designed for continuous industrial duty and dependable long life. Welded steel cabinet features lifting eyebolts and mounting skid. Panels are easily removable for complete access. ✓High-Ambient Condensers. Oversized to run cool in hot, dirty environments. All condensers are protected with a cleanable aluminum air intake filter. ✓Ozone-Friendly Refrigerants. Turmoil coolers use only approved, non-ozone-depleting refrigerants. ✓Complete Temperature Control. Choice of analog or digital controllers available with options to hold coolant within ±0.5ºF (±0.25ºC) of set-point. Hot gas bypass unloading eliminates compressor short cycling. ✓Super-Efficient Evaporators. For both oil- or water-based fluids. Brazed plate, immersion coil, or shell-and-tube design of stainless steel, copper, or steel construction depending on application. Tested for 350 PSI working pressure. ✓Industrial-Duty Compressors. Lifetime lubricated, hermetic reciprocating compressors (up to 3 HP). Dependable scroll compressors (up to 10 HP). Serviceable semi-hermetic compressors (up to 30 HP). ✓Continuous-Duty Pumps. Designed for use with the specific fluid being cooled and the application. Rotary gear pumps for oils. Centrifugal, turbine, and rotary vane pumps for water-based fluids. ✓NEMA-12 Oil-Tight Electrical Enclosures. Standard on most models. All three-phase models are supplied with a lockable rotary disconnect switch on the enclosure door. ✓ Wiring and Safety Certifications. All wiring meets NEC standards. All components are UL or CSA approved. Coolers can be customized with certified components and electrical designs to meet the specifications of many internationally recognized standards. ✓Serviceable Design and Available Components. 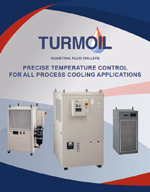 Turmoil coolers are designed to be serviceable by qualified local refrigeration contractors. Only the highest quality, internationally available components are used. All Turmoil coolers are covered by a limited one-year warranty. 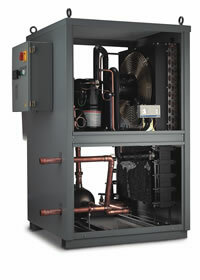 Extended warranties may be available for your chiller, if necessary please request a quote from Turmoil.